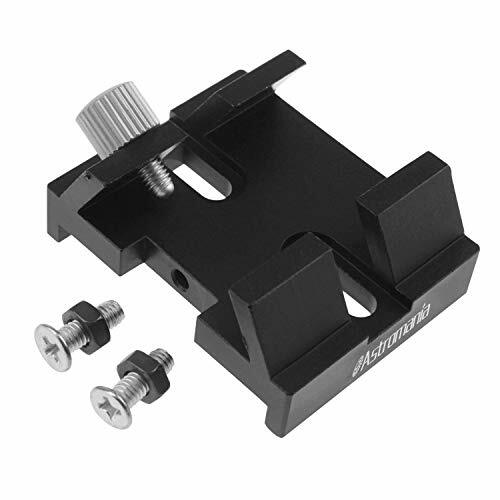 This specialized dovetail mounting base fits factory drilled holes on most Meade, Celestron, and Orion Schmidt-Cassegrain telescopes, allowing you to add a high-quality Astromania aiming device for enhanced performance under the stars. 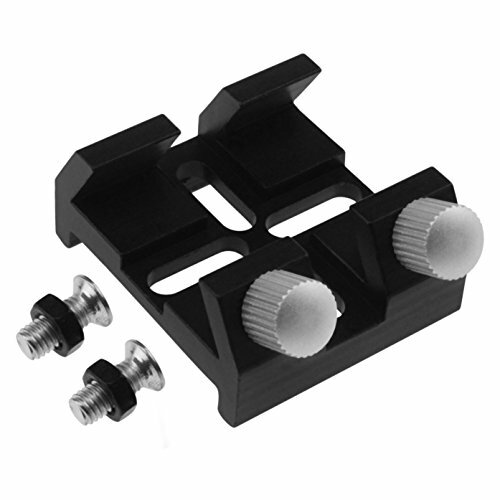 Aluminum dovetail base is designed to accept finder scope (with bracket) or EZ Finder. Ideal for custom installation of a finder scope on telescopes not already equipped with a compatible base. Bases feature two large thumbscrew locks to secure the finder scope bracket in place. Includes mounting hardware. There are two attachment screws to hold it to your optical tube assembly. Just put it on the optical tube and tighten the screws. Oval-shaped mounting holes make this dovetail base compatible with a wide variety of SCT telescopes. The dovetail base accepts the bracket of all Astromania finder scopes and EZ Finder reflex sights. Two large knurled thumbscrews makes it easy to install and detach your finder scope or reflex sight, even while wearing gloves. Fits factory drilled holes on Celestron, Meade, and Orion Schmidt-Cassegrain telescopes, attaches directly to Schmidt-Cassegrain Telescope (SCT) optical tube with included mounting hardware. Compliable with finder scope, Laser Pointer bracket or reflex sight bracket on telescopes, great for adding a second or third aiming device to your telescope. Made of high strength Aluminum with Anodizing Aluminium Process. The base is made of die-cast metal and features two large thumbscrew locks. Includes two M5 screws. Ideal for custom installation of any finder scope, EZ Finder reflex sight, and Green Laser Pointer bracket on any telescope. Dovetail base fits finder scope or reflex sight bracket so you can securely attach an aiming device to any telescope. Synta-style dovetail base -- Fit most bracket designs from Celestron, Orion, Sky-watcher, Vixen, etc. Compliable with finder scope, Laser Pointer bracket on telescopes. Drilled (but not threaded) to accommodate screws up to 5mm in diameter. Center-to-center screw hole spacing on your telescope must be from 10.2 to 30.2mm in order for this dovetail base to be compatible. 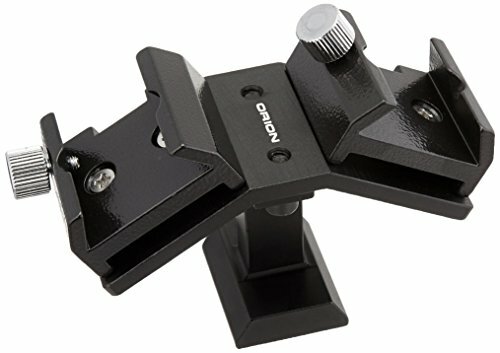 Attach two different aiming devices to your Orion telescope quickly and easily with the Orion Dual Finder Scope Mounting Bracket. Many amateur astronomers prefer using not one, but two finder devices to help aim their telescope accurately. For instance, using a magnified optical finder scope along with a non-magnifying reflex sight is very common thanks to the different aiming benefits offered by both designs. Our Dual Finder Scope Mounting Bracket makes it easy to two different aiming devices on one telescope. Since most telescope optical tubes are equipped with a single dovetail mounting base for a finder scope, hobbyists who wish to use two finder devices usually have to consider drilling a fresh set of holes into the telescope tube (and possibly voiding the telescope's warranty) in order to securely attach a second aiming device. Well, back away from the workbench and leave those tools where they are, because the Orion Dual Finder Scope Mounting Bracket lets you use two different aiming devices without having to hassle with drilling holes in your precious telescope tube. Since the Dual Finder Scope Mounting Bracket features two separate dovetail mounting base platforms on a single-stalk bracket, it allows two aiming devices to be mounted on a telescope equipped with a single dovetail base - no drilling required! You'll never go back to using just one finder scope again! Aiming a telescope is a joy when using the Orion 9x50 Illuminated Right-Angle CI Finder Scope thanks to its easy-to-see crosshairs, big 50mm aperture, correct-image view and comfortable right-angle design. While many finder scopes employ black crosshairs which are difficult at best to see against a night sky background, this deluxe model of ours features an adjustable-brightness red LED illuminator so the double crosshairs can be seen easily at night for efficient centering of celestial targets in a telescope. The comfortable right-angle orientation of the finder scope eye lens eliminates the need to contort your neck and back around your telescope while aiming. 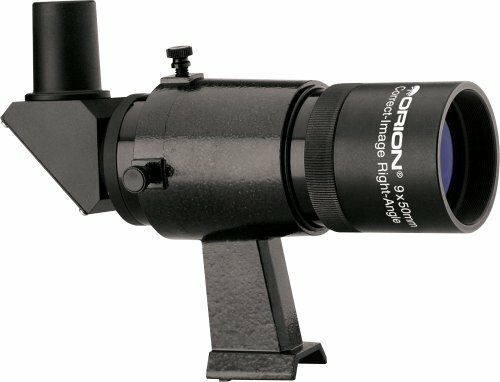 The Orion 9x50 Illuminated Right-Angle CI Finder Scope is particularly useful for those who stargaze with a Dobsonian reflector telescope, since using a straight-through finder to aim a Dobsonian can be difficult. The finder's correct-image view makes it easy to point your telescope accurately, since the view in the finder scope will have the same orientation as the unaided eye. 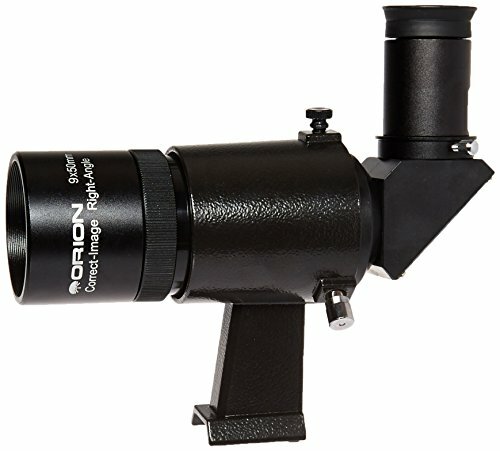 With moderate 9x power magnification and a wide 5-deg field of view, the fully coated Orion 9x50 Illuminated Right-Angle CI Finder Scope gives scale to small celestial objects as they pop out with a surprising amount of bright detail. The included finder bracket features a standard Orion dovetail foot and employs our popular spring-loaded X-Y adjustment design for simple calibration with any Orion telescope. Sometimes looking through a straight finder scope can be a strain, making you crouch down and crane your neck for a clear view. Well, you can call off the chiropractors because this Orion 9x50 Right-Angle Correct-Image Finder Scope lets you view in contortion-free comfort! What's more, it has a built-in Amici prism to provide a correctly oriented view - not upside-down as with standard finders. This achromatic crosshair finder scope sports deluxe features including fully coated glass lenses, internal baffling, and focus adjustment. The Orion 9x50 Right-Angle Correct-Image Finder Scope includes a sturdy aluminum bracket with two perpendicular thumbscrews and an oblique spring-loaded tensioner for easy two-step alignment - a big improvement over older six-setscrew designs. You'll have this finder scope aligned with your telescope in no time. The finder scope bracket features a dovetail foot that fits most Orion telescopes. An optional dovetail base can be purchased for custom installations, or for dual-finder scope desires. The right-angle prism and eyepiece are not removable, but focus can be adjusted by rotating the front lens housing. A locking ring lets you set the focus point however you wish. This Black 9x50 Right-Angle, Correct-Image Finder Scope is a large-aperture model ideal for use with bigger telescopes. With 50mm of aperture and a wide 5 field of view, you'll be able to identify bright deep space curiosities for clues of where to aim your telescope for more magnified inspection. The finder scope's significant 9x magnification makes it easy to aim your telescope with precision. Weighs 18.6 oz. The Celestron 9x50 right angle correct image (race) illuminated finder is a great upgrade to the stock finder scopes found on many Schmidt-Cassegrain telescopes. The 50 mm optics produce bright, sharp images with a magnification of 9x and a 5 apparent field of view. Meanwhile, the right-angle, correct-image design keeps objects Right-side up and left-to-right correct, making it easier to locate objects as well as track them as they drift through the field of view. The eyepiece module can be rotated left or right so you can find the perfect viewing angle. The double-crosshair reticle etched in the eyepiece makes it easy to center an object, whether you are aligning your computerized telescope or finding deep-sky objects on your own. The reticle can be focused separate from the finder itself. A battery-powered Illuminator lights up the crosshair with a soft, red glow, and the illumination can be easily adjusted by turning the on/off knob. The Celestron 9x50 race finder comes with a sturdy bracket consisting of two rings and an integrated dovetail. Adjusting the alignment of the finder is easy with the oversized Thumbscrews. The dovetail allows for easy attachment to and removal from most Schmidt-Cassegrain and edge HD optical tube assemblies without affecting the alignment of the finder scope. Upgrade your Finder and stop straining your neck and back! This guide scope takes does the job of a "classic" guide scope - but it is lighter and much easier to use! Previously, long and unwieldy guide scopes were used to locate a guide star. But this is no longer necessary! The sensitivity of modern astronomy cameras makes this possible. You simply attach the mini guide scope onto your telescope like a finder.Or you can use it as a convenient, large finder scope and spend less time locating objects when visually observing. What is special about our Astromania guide scope? 1)It has a built-in worm-gear focuser with 10mm displacement, allowing very precise focus adjustment. The mechanism has a fixed orientation - so there is no rotation of mounted cameras or eyepieces - or also the field of view with your guide star - when focusing. 2)The robust metal housing is made of black, anodized aluminium: It not only looks solid, but is very sturdy. A milled and knurled focusing ring allows straightforward and precise fine focusing. It comes with matching tube clamps and a Synta-style mounting plate to make assembly and disassembly as simple as possible. 3)The 70mm Guide Scope is a complete and compact guide scope solution designed for use with nearly each autoguider and CCD camera in the market. 4)The included adapter plate can be used to attach the dovetail base and 70mm Guide Scope to any standard dovetail plate or side-by-side plate if preferred. 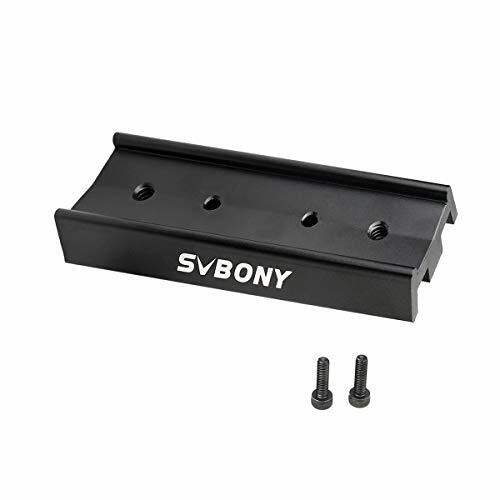 If you need a Guide Scope Mount, We'd recommend the ASIN: B015VZGP52 - Astromania Guide Scope Mount - the convenient way to mount your guide scope. 5)Consisting of a 70mm aperture, 400mm focal length achromatic refractor guide scope, an adjustable dovetail guide scope bracket, an 1.25" aluminum parfocal ring, an adapter plate, the 70mm Guide Scope makes it easy for any astro-imager to enjoy the precision of autoguiding in their images. Mini-guide tube to quickly find objects and guiding stars, designed both for visual, as well as for photographic use. 400mm focal length. With bright, wide-field optics puts numerous potential guide stars in view so you'll never have to search for one! Have a built-in worm-focuser with Brass Compression Ring and 2 thumbscrews,90mm focusing range (10mm focusing range with micro-focusing Helical focuser, the rest is by a fixable, scaled drawtube) is made possible by an extremely precise focus adjustment. Take any 1.25 inch eyepieces in your collection, worm-focuser: fast focusing. Prevents rotation of the camera and eyepiece. Or use it as a comfortable, large viewfinder to waste less time finding objects in visual observation. It comes with matching pipe clamps and a Synta-style mounting plate to make assembly and installation as easy as possible. The sturdy metal housing made of black anodized aluminum. Looking out not only solid, but is also very robust. 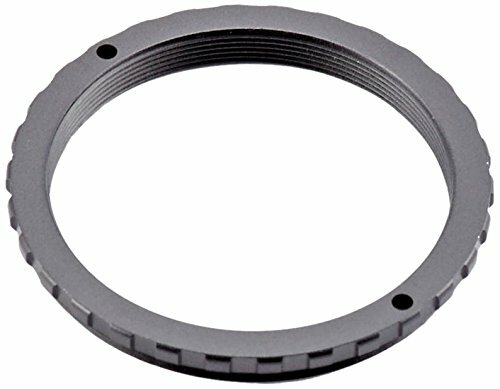 A milled and knurled ring allows easy and precise fine focus adjustments. Adjustable-aim dovany weight to an astrophotography setup and can conveniently be stashed in an accessory case between uses. 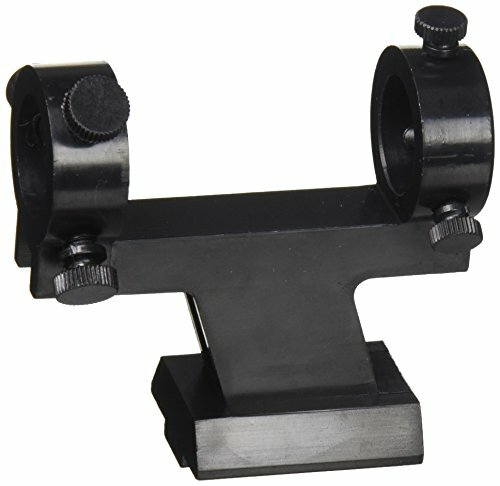 Dovetail guide scope bracket installs on virtually any astrophotography telescope quickly and easily. The versatile Finder Deluxe Telescope Reflex Sight will help you take your telescope in new directions! Perfect for use during the night and daytime, the Finder Deluxe sight features both a red LED for nighttime aiming and a brighter green LED for aiming in twilight and most daylight conditions. Reflex sights are popular thanks to the intuitive, non-magnified method they employ to help you aim your telescope accurately. Depending on your chosen LED color, a small LED emits a red or green aiming pattern onto a viewing window which you peer through to aim the telescope after a simple alignment procedure. Once the pattern is lined up with your intended target object, you're all set to view it through the telescope. Many amateur astronomers use both a magnified finder scope and a reflex sight to provide helpful options for pointing their telescope accurately. 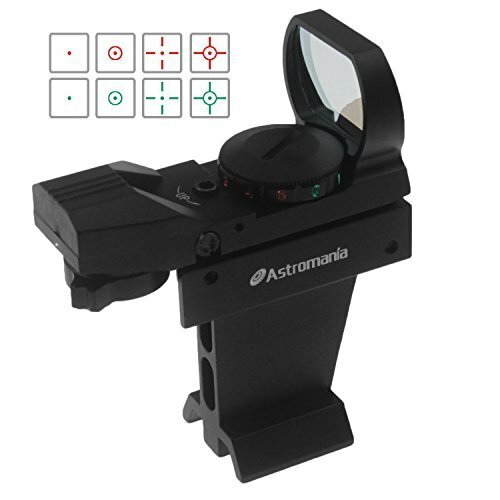 With four different red or green LED-illuminated reticle patterns to choose from, the EZ Finder Deluxe II makes aiming your telescope easier than ever. Five brightness levels let you adapt the reticle's intensity to the prevailing viewing conditions. This reflex sight aiming device for any telescope has a larger viewing window than the Finder, making the Finder Deluxe easier to use as it projects the chosen pattern on a wider area of sky or horizon. Vertical and horizontal fine-adjustment screws allow precise alignment with the main telescope. All-metal construction gives the Finder Deluxe Telescope Reflex Sight the precision and durability demanded by serious observers. The sight includes a machined dovetail finder scope bracket that fits most telescopes or our dovetail mounting bases (sold separately). A single CR2032 lithium button-cell battery (Not Included) is required for use. Finder Deluxe features a large viewing window, four different aiming reticle patterns to choose from, and five brightness levels of red or green light. The power of the finder will be turned off when you turn the knob to "R" or "G". Horizontal and vertical fine-adjustment set-screws allow precise alignment of the reflex sight with the telescope. Includes dovetail finder bracket that fits most telescopes. Requires CR-2032 lithium button-cell battery (Not Include). The Finder Deluxe is a non-magnifying reflex sight that makes aiming your telescope easier and more accurate than ever - day or night! Finder projects a small red or green LED reticle pattern onto a viewing window so you can easily aim your telescope at night or during the day. Reflex sights are popular thanks to the intuitive, non-magnified method they employ to help you aim your telescope accurately. Depending on your chosen LED color, a small LED emits a red or green aiming pattern onto a viewing window which you peer through to aim the telescope after a simple alignment procedure.Once the pattern is lined up with your intended target object, you're all set to view it through the telescope. ZEROING: Select the reticle you desire by turning the reticle selector knob and set the intensity at the best position for you. With the E/D sight mounted,rest gun on a solid support and aim at a target 50 to 100 yards away.Test shots should be done in the same conditions to achieve maximum accuracy for adjustment,for which the use of firm rest for firing and same type cartridge is recommendable.Each click adjustment moves the point of impact by 1 MOA(approximately 1 at 100vbs,1/2 at 50 yds). Sometimes looking through a straight finder scope can be a strain, making you crouch down and crane your neck. Well, you can call off the chiropractors because our right-angle finder scopes let you view in contortion-free comfort! What's more, they have a built-in Amici prism to provide a correctly oriented view - not upside-down as with standard finders. These achromatic, crosshair finders feature fully coated glass lenses, internal baffling, and focus adjustment. Each includes an aluminum bracket with two perpendicular thumbscrews for easy alignment. Dovetail foot fits many Orion telescopes. Dovetail base (#7214) can be purchased separately for custom installations. Prism and eyepiece are not removable. Right-angle design lets you aim your telescope in comfort - no more crouching or craning your neck! 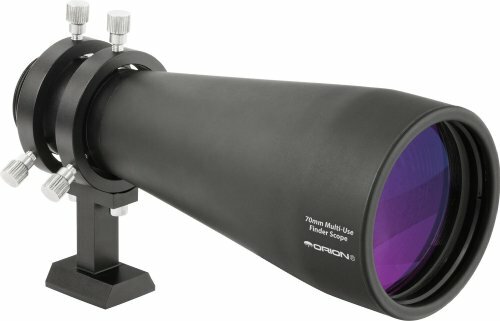 Build your own custom telescope aiming device with the modular Orion 70mm Multi-Use Finder Scope. 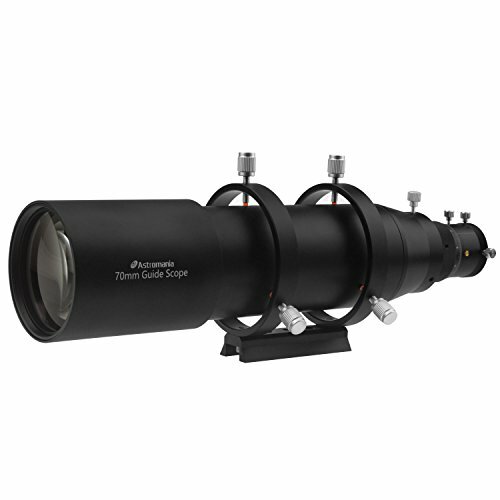 This finder optical tube allows you to customize your own 70mm optical finder scope by adding optional eyepieces, diagonals, video cameras, and more to create a complete finder solution for your telescope. Depending on your particular aiming needs, it's easy to customize the Orion 70mm Multi-Use Finder Scope so it will provide optimal aiming for your astronomy setup. Since the 70mm aperture lens is capable of gathering twice the amount of light compared to a 50mm finder scope, you'll be able to aim your telescope with the help of brighter, more detailed views of starry skies. Six adjustable alignment thumbscrews on the Multi-Use Finder Scope's mounting bracket make it easy to accurately align the finder with your telescope. In order for the 70mm Multi-Use Finder Scope to reach focus, a 1.25" mirror or prism diagonal is required along with a 20mm or shorter focal length 1.25" telescope eyepiece, illuminated reticle eyepiece, imaging camera, video camera, or autoguiding device. With approximately 10mm of helical focus travel, you'll be able to achieve sharp focus through this 70mm Multi-Use Finder Scope with most combinations of diagonal and eyepiece, or diagonal and imaging accessory. (All eyepieces, diagonals, and astrophotography accessories sold separately). It's like having multiple finder scopes in one! Astromania SGCMOS Series Telescope CMOS Camera is guiding CMOS camera and it adopts ultra-high performance CMOS sensor as the image-picking device. USB2.0 is used as the data transfer interface. A built-in ST4 auto guider port is designed for the easy connection of the auto guider.Aluminum CNC housing with standard 1.25 inch interface(outer) to fit to telescope eyepiece and standard C-mount(inner) for standard industrial lens.Native/ASCOM/WDM driver for easy connection with 3rd party astrophotography software.The SGCMOS camera can be widely used in astrophotography (Moon, Sun, Planets as well as Galaxies, Cluster and Nebulae). Carefully selected sensor with high sensitivity and fast frame rate,as well as long time exposure,protect window with IR-Cut filter. Aluminum CNC housing with standard 1.25" interface(outer) to fit to telescope eyepiece and standard C-mount(inner) for standard industrial lens. A built-in ST4 auto guider port for the easy connection of the auto guider,thermal design to transfer the sensor heat to the aluminum house quickly. Dedicated astrophotography software to support video preview, video record, video processing, image capture and process, dark field correction and raw data output. 1.25 nosepiece for precise focusing and 1.25 astronomical filter installation,Native/ASCOM/WDM driver for easy connection with 3rd party astrophotography softwares. 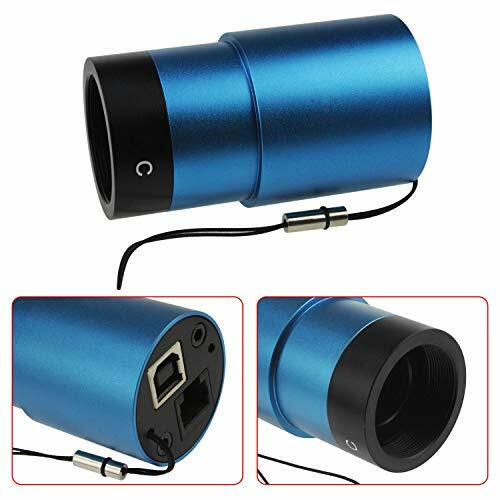 A:Gift box L:15cm W:15cm H:10cm (0.8~1.0Kg/ box) B:GCMOS series USB2.0 C-Mount camera C:High-speed USB2.0 A male to B male gold-plated connectors cable /2.0m D:2.0m guide cable E:1.25 inch nosepiece F:CD (Driver & utilities software, 12cm). This small Guidingscope handles all the tasks of a "classic" Leitfernrohrs - but it is lighter and much easier to use! Previously used to long and large Leitfernrohre to find a guiding star. Eliminate the need to! The sensitivity of modern astro imagers is on your side. The Mini-Guidesope set as a viewfinder on your telescope.The 60mm Guide Scope is a complete and compact guide scope solution designed for use with nearly each autoguider and CCD camera in the market. The Guide Scope is ideal for guiding long-exposure astrophotographs with imaging telescopes up to 1500mm in focal length. 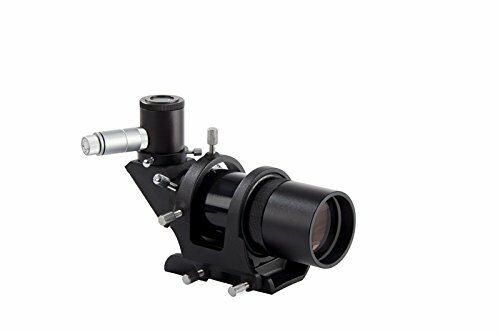 Consisting of a 60mm aperture, 240mm focal length achromatic refractor guide scope, an adjustable dovetail guide scope bracket, an 1.25" aluminum parfocal ring, a dovetail mounting base, and an adapter plate, the 60mm Guide Scope makes it easy for any astro-imager to enjoy the precision of autoguiding in their images. All this pint-sized setup requires is a StarShoot AutoGuider or similar small-chip CCD autoguider and it's ready for night, camera, action! The guide scope bracket fits into the standard dovetail finder scope base found on most telescopes. If your imaging scope doesn't feature a dovetail base or has one already occupied by an oft-used finder, the dovetail base not include and attachment hardware lets you attach the 60mm Guide Scope to any optical tube. Alternatively, the included adapter plate can be used to attach the dovetail base and 60mm Guide Scope to any standard dovetail plate or side-by-side plate if preferred. If you need a Guide Scope Mount, We'd recommend the ASIN: B015VZGP52 - Astromania Guide Scope Mount - the convenient way to mount your guide scope. 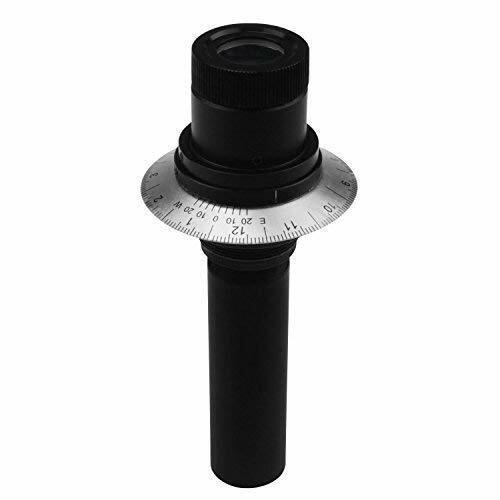 Mini-guide tube to quickly find objects and guiding stars, designed both for visual, as well as for photographic use.Take any 1.25 inch eyepieces in your collection, worm-focuser: fast focusing. Prevents rotation of the camera and eyepiece. Or use it as a comfortable, large viewfinder to waste less time finding objects in visual observation. 240mm focal length. Compact mini guide scope designed for use with astrophotography telescopes up to 1500mm focal length. With bright, wide-field optics puts numerous potential guide stars in view so you'll never have to search for one! The sturdy metal housing made of black anodized aluminum. Looking out not only solid, but is also very robust. A milled and knurled ring allows easy and precise fine focus adjustments. It comes with matching pipe clamps and a Synta-style mounting plate to make assembly and installation as easy as possible. Have a built-in worm-focuser with Brass Compression Ring and 2 thumbscrews,45mm focusing range (10mm focusing range with micro-focusing Helical focuser, the rest is by a fixable, scaled drawtube) is made possible by an extremely precise focus adjustment. The mechanism has a determined orientation: This is mounted cameras or eyepieces - and thus also the area with your guide stars - not rotate during focusing. 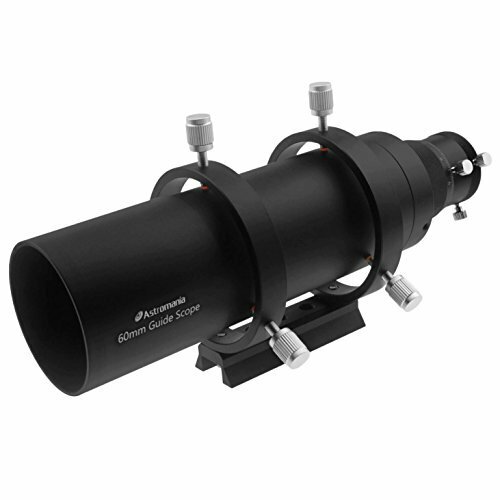 Astromania Schmidt-Cassegrain Finder Scope Base fits factory drilled holes on Celestron, Meade, and Orion Schmidt-Cassegrain telescopes, attaches directly to Schmidt-Cassegrain Telescope (SCT) optical tube with included mounting hardware. Allows you to attach any standard finder scope, Laser Pointer bracket or reflex sight bracket to Schmidt-Cassegrain telescopes (SCT) up to 11 inch aperture, great for second or third aiming device to your Schmidt-Cassegrain for multiple aiming options. Made of high strength Aluminum with Anodizing Aluminium Process. The base is made of die-cast metal and features one large thumbscrew locks. Includes two M4 screws. Synta-style dovetail base -- Fit most bracket designs from Celestron, Orion, Sky-watcher, Vixen, etc. Compliable with finder scope, Laser Pointer bracket on telescopes. The clamp in the bottom of dovetail base is fit standard Vixen dovetail bar. Drilled (but not threaded) to accommodate screws up to 4mm in diameter. Center-to-center screw hole spacing on your telescope must be from 21 to 37.3mm in order for this dovetail base to be compatible. Allows you to attach any standard finder scope, Laser Pointer bracket or reflex sight bracket to Schmidt-Cassegrain telescopes (SCT) up to 11 inch aperture, great for second or third aiming device to your Schmidt-Cassegrain for multiple aiming options. Made of high strength Aluminum with Anodizing Aluminium Process. The base is made of die-cast metal and features one large thumbscrew locks. Includes two M4 screws. Synta-style dovetail base -- Fit most bracket designs from Celestron, Orion, Sky-watcher, Vixen, etc. Compliable with finder scope, Laser Pointer bracket on telescopes. The clamp in the bottom of dovetail base is fit standard Vixen dovetail bar. Drilled (but not threaded) to accommodate screws up to 4mm in diameter. Center-to-center screw hole spacing on your telescope must be from 21 to 37.3mm in order for this dovetail base to be compatible. This small Guidingscope handles all the tasks of a "classic" Leitfernrohrs - but it is lighter and much easier to use! Previously used to long and large Leitfernrohre to find a guiding star. Eliminate the need to! The sensitivity of modern astro imagers is on your side. 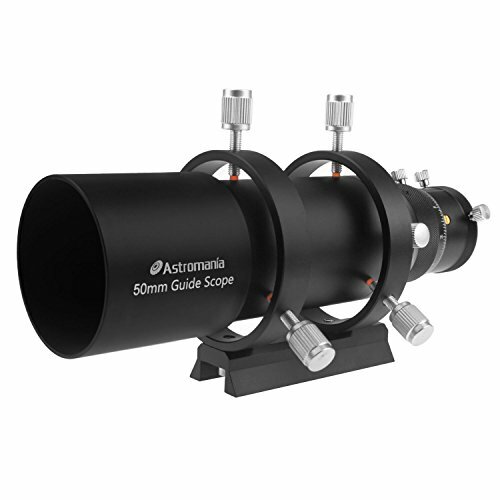 The Mini-Guidesope set as a viewfinder on your telescope.The 50mm Guide Scope is a complete and compact guide scope solution designed for use with nearly each autoguider and CCD camera in the market. The Guide Scope is ideal for guiding long-exposure astrophotographs with imaging telescopes up to 1500mm in focal length. Consisting of a 50mm aperture, 190mm focal length achromatic refractor guide scope, an adjustable dovetail guide scope bracket, an 1.25" aluminum parfocal ring, a dovetail mounting base, and an adapter plate, the 50mm Guide Scope makes it easy for any astro-imager to enjoy the precision of autoguiding in their images. All this pint-sized setup requires is a StarShoot AutoGuider or similar small-chip CCD autoguider and it's ready for night, camera, action! The guide scope bracket fits into the standard dovetail finder scope base found on most telescopes. If your imaging scope doesn't feature a dovetail base or has one already occupied by an oft-used finder, the dovetail base not include and attachment hardware lets you attach the 50mm Guide Scope to any optical tube. Alternatively, the included adapter plate can be used to attach the dovetail base and 50mm Guide Scope to any standard dovetail plate or side-by-side plate if preferred. 190mm focal length. Compact mini guide scope designed for use with astrophotography telescopes up to 1500mm focal length with bright, wide-field optics puts numerous potential guide stars in view so you'll never have to search for one! Have a built-in worm-focuser with Brass Compression Ring and 2 thumbscrews,40mm focusing range (10mm focusing range with micro-focusing Helical focuser, the rest is by a fixable, scaled drawtube) is made possible by an extremely precise focus adjustment. The mechanism has a determined orientation: This is mounted cameras or eyepieces - and thus also the area with your guide stars - not rotate during focusing. The polar finder is simply screwed into the back of the mount. Correct alignment of the mount can be achieved within a very short time with this improved polar finder. Good alignment of the mount with the North Celestial Pole can be achieved in a short time by using the polar finder. As the celestial North Pole (to which the telescope mount must be aligned) does not exactly coincide with the position of the Pole Star, using this polar finder is very important. There are two models here which have the same functions you may receive one of them. The new model is easier to use than the old one with Big Dipper and a target-spot.As we know, Polaris position changes as time passes, the improved product solve this problem when doing polar alignment in Northern hemisphere, it allows you put Polaris on the the correct circle corresponding to the present year for better alignment precision. Here are a few APPs that can give Polaris orientation in the FOV of a polar scope depending on the observer's position and local time. Generally, the orientations are given in time format. The new reticle has a clock like engraving which is compatible with these applications. For polar alignment, rotate the R.A. axis of the mount to put the 0 o'clock of the reticle at the highest position in the FOV of the polar scope, then place the Polaris at the corrent clock position given by the SynScan hand control or other applications.Polaris position also changes as time passes. The new reticle displays 3 circles to represent Polaris's orbit in year 2012, 2020 and 2028. It also gives sub-dials at 0, 3, 6, and 9 o'clock position for year 2016, 2024 and 2032. An engraving labeled with the above years is also displayed on the right of the FOV for memo purpose. This is the latest version with new reticle engraving. Good alignment of the mount with the North Celestial Pole can be achieved in a short time by using the polar finder. The sighting is improved, with the precise alignment making long-term astrophotography possible. The viewfinder arrangement has been further improved, with precision alignment now possible allowing long exposure photography to be done. Correct alignment of the mount can be achieved within a very short time with this improved polar finder. As the celestial North Pole (to which the telescope mount must be aligned) does not exactly coincide with the position of the Pole Star, using this polar finder is very important. This accessory threads into the mount's housing along the Right Ascension axis. The optics feature a printed reticle that makes aligning on Polaris easy and fast. Quick polar-alignment gives you more time to enjoy the view at the telescope eyepiece. Ensures accurate tracking and slow-motion control for your telescope mount. There are two models which have the same functions you may receive one of them. The new model is easier to use than the old one with Big Dipper and a target-spot. Please refer to the product description for details. 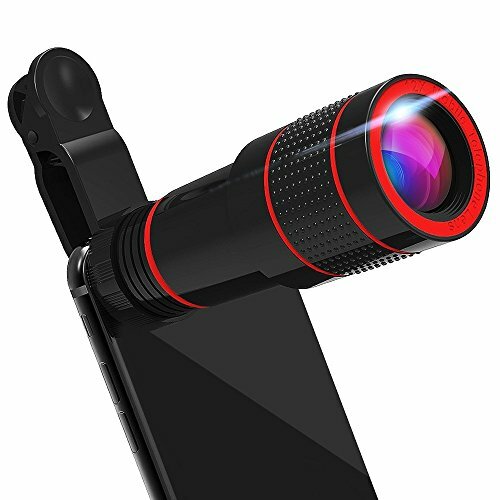 12X zoom lens to transform your phone into an instant telephoto camera lens, overcome the limitation of smartphones and help you take quality photos like a pro. Comes with a detachable clip that snaps onto your phone snugly without damaging your phone. You can simply adjust the manual focus ring to get the optimal photo effect. Universal compatibility, work on all popular brands and models of smart phones and tablets or anywhere you can imagine. Good for sporting events, concerts, bird watching, camping, and travelling to get high resolution closeups or telescope quality pics without carrying cumbersome cameras. 12 Months Warranty, 30 Days Money Back Guaranteed. Make sure you spend your money with ZERO risk. Now you can use the Orion SkyLine Green Laser Pointer (GLP) to aim your telescope! This dual-ring ABS bracket holds the GLP and mounts like a standard finder scope. The bracket's dovetail foot fits the finder scope base of most Orion telescopes, as well as our dovetail mounting bases. The spring-loaded X-Y adjustment thumbscrews enable quick alignment of the GLP with the telescope. The SkyLine GLP makes pointing any telescope super easy. The green beam shows exactly where your telescope is aimed. No need to crouch in odd positions to peer through a standard finder scope! Bracket includes an On/Off thumbscrew collar for the GLP, which allows continuous On functionality while you align on your target object. SkyLine GLP sold separately. The telescope has a T-2 internal thread.